Below is a selection of testimonials we have received over the years from many happy couples. Wonderful service and friendly people. Would definitely recommend them. Thanks again Classic and Prestige Car Hire. The whole day went off perfectly and the service we received during the day was exceptional. We found the whole experience from the day we first saw the cars, through signing up and on to the day to be easy, comfortable and professional. Paul and I would like to thank you for your help on opur wedding day. The cars were beautiful and the service was exceptional. I just wanted to say a big thank you for making our day a special one. The service was fantastic and the Silver Clouds looked great and everyone loved them. Thank you for the excellent service you provided for our wedding. Your drivers were obliging, courteous and extremely professional. We would highly recommend Classic and Prestige car Hire to our friends. Thank you for your first class service; everyone commented on how helpful and friendly you were and how beautiful the cars were. We would happily recommend you 100 times over. We'd like to thank you from the bottom of our heart for your wonderful service in the lead up to, and including our wedding day. Your drivers should be commended for their care and assistance on the day. They were exceptional. The cars completed our fairytale wedding and were the icing on the cake. We would like to thank you for making our wedding as memorable as it was. Choosing the transport vehicles is an important decision for a wedding, but from the moment we met with you, we were impressed by your professionalism and friendliness. From the initial meeting, you were always happy to be of assistance, support and guidance. You made everything so easy for us and made sure on the day, we were well looked after. We were fortunate to have Classic and Prestige Car Hire transport us on our wedding day and have not hesitated in recommending you to everyone we can. We would like to thank you so much for being part of our special day. To us, you provided so much more than service. In preparation for our day, you were diligent and thorough with all of the detail. On the day, we felt you and your drivers all fully engaged in all aspects of the occasion. We believe that the interactions between yourselves and the photographer was flawless and delightful. We will proudly recommend your service to our friends without hesitation. It was a delight to have you drive us around on our wedding day. Your professionalism both prior to and on the day, attention to detail and the immaculate vehicles would have us highly recommend you to any other couples. 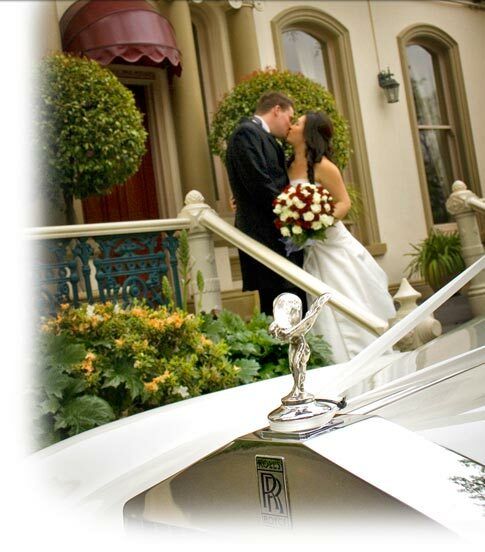 The cars look brilliant in the photographs and we will have unduring memories of our wedding day and the Rolls-Royces. Our most sincere thanks for helping us to relax after a shaky start to the day, hair disaster and rain. From the minute we stepped in to your beautiful cars we felt the stress melt away and felt like royalty. Thank you so much for your magnificent and professional service on our wedding day. We loved our Rolls-Royce experience. The bubbles provided for refreshment was a super surprise. Pre wedding planning was so easy thanks to John's positive attitude and advise. Thank you for making our day so memorable. I wish I could tell every future bride and groom to enjoy the luxury of your beautiful Rolls-Royces and your kind and wonderful service. It was a pleasure to have you share our day with us. You and your team went above and beyond to ensure that everything went smoothly. The beautiful shawls you provided were especially appreciated by the girls. The cars were absolutely gorgeous and your professionalism and friendly and genuine nature meant we did not have to worry about a thing and we appreciate that more than we can say. We wish we could tell every future bride and groom about you. Thank you for helping create such a perfect wedding. Your Rolls-Royces were beautiful and your drivers treated us like royalty. I felt like a princess for a day.